Many NBA fans lament the current state of basketball rivalries, in which teams might hold some animosity towards each other on the court but generally get along off it. With players having faced off since their AAU careers began and the high amount of roster turnover in the league, it's simply not in everyone's interest to play with hate. If these players haven't played together in the past, they might in the future. In fact, Duncan hates Kevin Garnett. Hates him the way liberals hate Sean Hannity. This information comes from very reliable sources, who talk about how KG has made a career of trying to punk Duncan, baiting him and slapping him and whispering really weird smack into his ear. 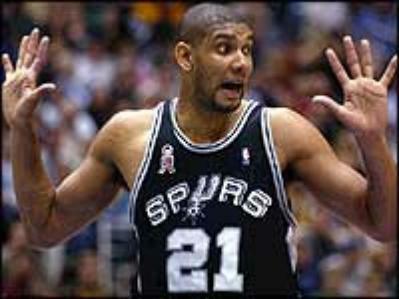 They talk about how funny this is, because the worst thing you can do as an opponent is piss off Duncan. Then, as Malik Rose says, "he f------ destroys you." Duncan's lifetime numbers versus Garnett's teams, by the way: 19.4 points per game, 11.6 boards and a 44--17 record, including the postseason. Duncan is diplomatic about the topic. Asked if perhaps all those years battling Garnett have softened his feelings for the man, led to a Magic-Larry type of kinship, Duncan leans back on the couch in his hotel room and grins. There is a pause. A longer pause. Finally he says, "Define kinship." Knowing Garnett's on-court personality, I'd guess that he doesn't quite see his relationship with Duncan as particularly combative — this is just how Garnett approaches playing basketball against anyone. And while Duncan is obviously a competitive guy, he also looks at the sport as a craft to be mastered rather than a battleground of psychological warfare. It's important, but it doesn't have to be personal. On the other hand, this rivalry has probably helped both players more than two people who hate each other might be willing to admit. That's true in the sense that rivalries often bring out the best in the participants, but also in that the players are so different that watching them against each other helps emphasize what makes them so special. Duncan, though prone to reacting incredulously to foul calls, is a calm professional, the sort of player who goes about his job and performs it with few frills. 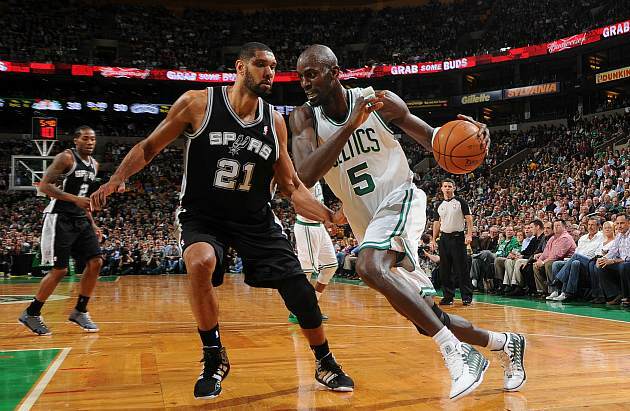 Garnett is the most intense player of his generation, the sort of guy who screams and talks trash as if they sustain him physically. The contrast is fascinating. If Chris Bosh can't recover from injury to help the Heat and the Spurs continue to look like a great team, we might even see Garnett and Duncan play each other in this June's NBA Finals. Their hatred might play out, but the positives of watching them battle in the post would be apparent, too. Even when hate is present, there's plenty for fans to cheer.